Somehow, recently, I was reunited with my baby book. I never thought my mom would give it up and I never thought it would now sit in a box in my garage. I also never thought I would have paged through it three times in the last nine months. My mom was diligent about recording my early life. 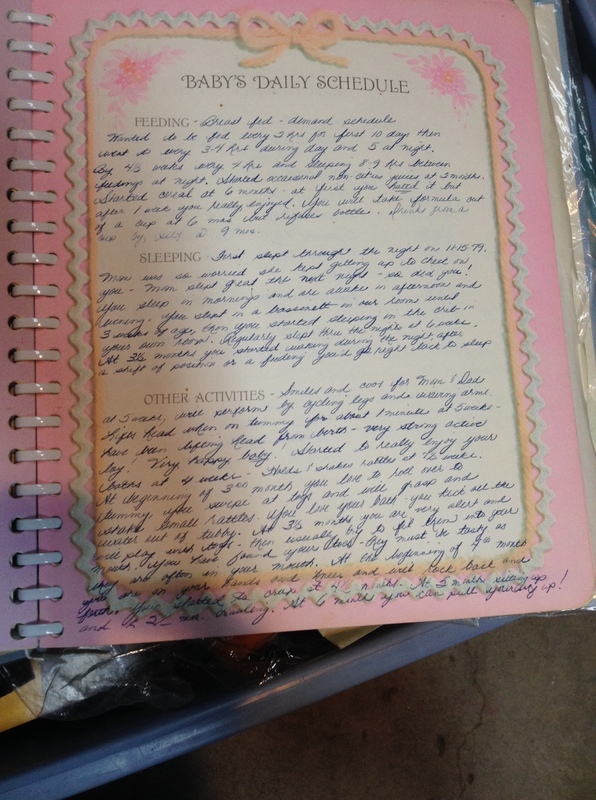 There’s very little I remember in there, but it’s intriguing to see how diligent my mom was, in her beautiful cursive, about noting accomplishments in my early years. In this age of digital technology and ease of information, I wish I were better about noting my daughter’s accomplishments. Sometimes it’s not enough to try and take a picture of her every day. My dad has never been a great gift giver. Every Christmas I could always look forward to used DVD’s from Blockbuster and a gift card. Now that Blockbuster is out of business, he’s painted himself into a corner. This year he got his first grandchild a gift card to Target and a lengthy Hallmark card. But the card wasn’t typical for him, gushing with words he felt but could never vocalize. This is a six-page card with empty spaces to record gifts and photos and how my kid enjoyed her first Christmas. Certainly I’ll remember that my daughter loved sitting on her brand new Minnie Mouse airplane and being pushed around the house. Or the thrill she got when we took her toy BMW outside and pushed her up and down the sidewalk, the wind blowing through the little strands of hair she has. Or how excited she initially was to stand and push her new lion walker, the pride she felt in her ability to be able to be a bipedal human, if only for a few moments. And we have the photos of each of these moments. They live in the jumble of our digital memories inside of our smartphones. Therein lies the issue. There is no epicenter to bring it all together. Shortly after we found out we were having a baby, I went and bought a photo album. I planned on recording every moment of my child’s first year. I’ve done that to an extent, through this blog and through my photos. Rare, though, is the day that they end up in that album. As we have started deconstructing our house from Christmas, there lied a pile of cards on our kitchen counter from our friends and relatives. After hanging them around the house, we usually take one final look at them and then they end up in the garbage. Unfortunate as it sounds, I know we’re not the only ones who do this. 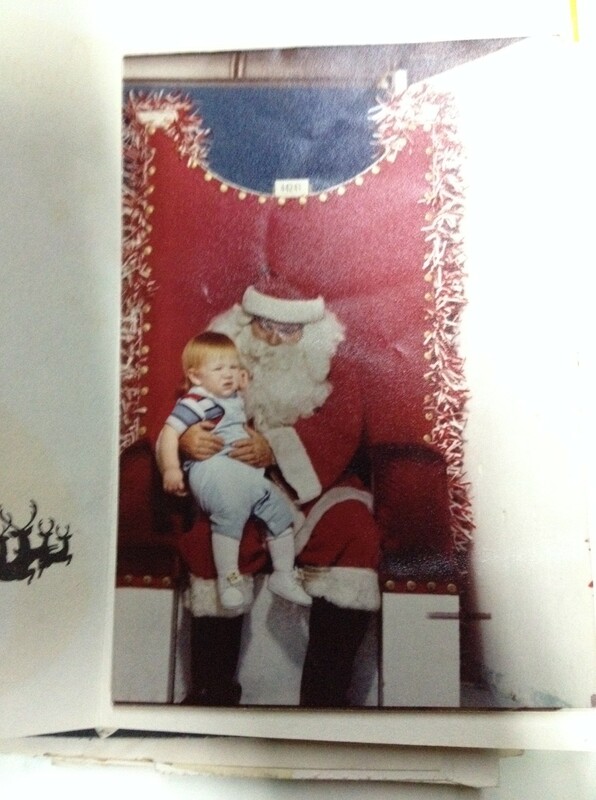 One of my first times with St. Nick. Tonight, sitting just off center, was the “Baby’s First Christmas” card. While we may recall the initial reactions that our kid had during her first Christmas and the gifts that were given to her, how is it possible for us to replicate that joy she had – even at 10 months old – without seeing the glint in her eye? Without recalling the way her mouth shaped a tiny “O” when she first sat on the Minnie Mouse plane? Or the way she squinted her eyes and opened her mouth as big as possible with the pleasure she got from being pushed on her new BMW car? Memories are only as good as your brain allows them to be. Will we recall every detail in three months? In six? Next Christmas? My baby book has everything from my mom’s first thoughts of bringing me home from the hospital through my sixth grade report card. It has documented evidence of who visited me when I was a newborn and what they brought over – almost like a registrar’s book. It has photos of my first bath and of the first few years I visited Santa Claus. Not only do I get to see what I looked like as a baby, but I get to see what my grandfather looked like with dark hair. Or what my dad looked like with hair. I can comb through it and try and recall the neighbors we had or the friends we’ve stayed in touch with or those who we’ve needed Facebook to reconnect with. Every time I reach for it, it’s like opening a time capsule. The other day my wife purchased new toner for our printer. I’m so glad she did. We have a lot of Christmas memories to print out and put in that little card. Our kid will appreciate it. My mum kept a similar baby book for me and brought it down with her just after our son was born in April. It was great to look through it. We haven’t been anywhere near as diligent with keeping a baby book but I’m hoping that my dad blog will in some way make up for this. I agree, Jonathan, about the blog as being a time capsule/baby book of sorts. But I also wanted something tangible to be able to hand her. Although when she’s 20 I’m sure she’ll have a computer chip in her arm and won’t know what an actual book is. haha! I see what you mean about the value of something tangible. I’m planning to print out the blog posts I do and put them in a nice little scrapbook or something like that. I should probably think about starting that pretty soon as I’ve done about thirty posts in the last six months.